"Of course, now I want to pop over to Cirencester (it’s only 40 minutes in the car) and pose like Alice and Shino. If only I knew someone who’d be willing to be my accomplice in so silly a mission." 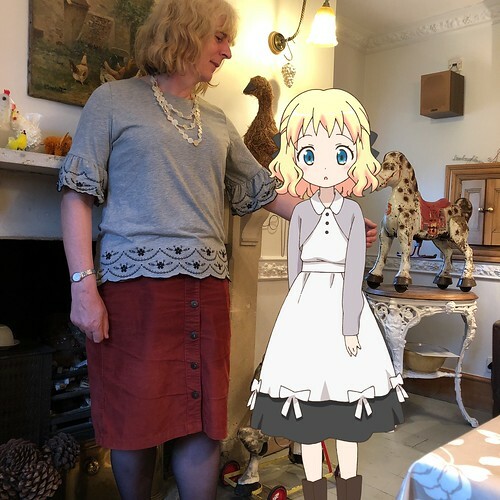 I wrote those prophetic words in a post from May 2015, having only recently discovered that one of the settings of Kiniro Mosaic was Cirencester High Street. Now I understand of course that such posing trips (or seichi junrei/聖地巡礼 - a phrase translating roughly to "sacred pilgrimages") are utterly standard anime fan behaviour. Indeed, in Japan - where, naturally, most anime are set - city and prefectural governments often cooperate with anime studios to promote an anime with a local setting: the anime and the area provide each other with publicity, and everyone benefits. There's even an 88 stop anime pilgrimage route you can go on, much as pilgrims of old (and of now) take tours round various temples and shrines, getting a stamp in each on to prove they've done it. (Christian pilgrims are of course not dissimilar, with their collections of palms and scallops.) Some people pose as their anime heroes and heroines, possibly in cosplay, while others take a figurine to photograph in situ. Now, is this the same kind of thrill people get from going round, say, Hemingford Grey Manor and mentally inserting the characters from the Green Knowe books, as I was doing exactly a year ago? Or is it very different? ( really like your top.